A Michigan resident, “Dave”, sent us an email with an attachment that he “thought (we) might find interesting”. 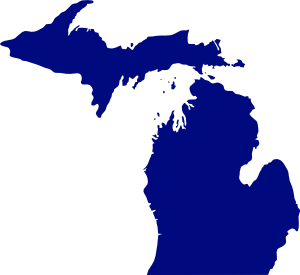 …and the actual Map of Michigan…. Congressman Hoekstra’s staffers are lazy or sloppy (or both). They didn’t reserve the PeteHoekstra.com domain name and they’re using an incorrect image of the state of Michigan in campaign correspondence. Campaign and staff members are a direct reflection of their leader. Hoekstra clearly doesn’t demand the best, yet he’s the first in line to throw stones at others — often times when the criticism is undeserved. Where does the buck stop, Pete?